I think I have it figured out! 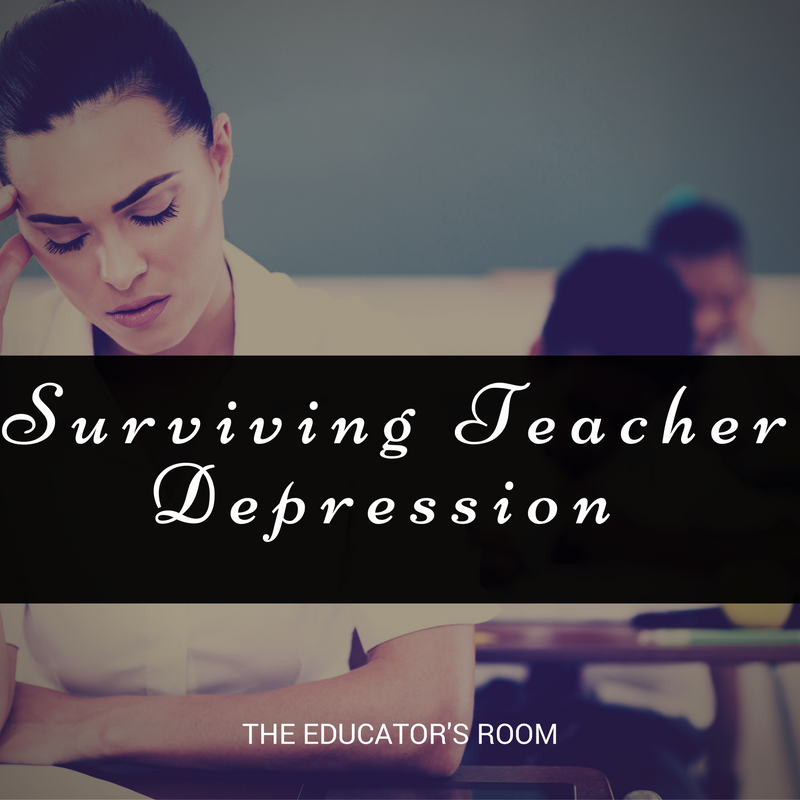 After 22 years of listening to teachers discuss their depression, I just had to ask myself, “Why do teachers suffer from SO much depression?” Every year, teachers by the thousands report symptoms of depression or anxiety. I’ve expressed this many times myself. While clinical depression is caused by chemical imbalances in the brain, there are many environmental factors that can contribute to a depressive mood. So let’s take a look at some of the things that teachers must deal with daily and see if we can better understand why we have such an epidemic of depression in teachers. In life, we pride ourselves on making good decisions and being successful in life. We choose our home, we choose our profession, and we choose our mate. We are only limited by our own imagination and ability to finance our dreams. However, in our classroom, we lose control over some very important aspects of our work. We are given curriculum. Strategies are defined and required from the outside. For instance, in our LATI classrooms, the activity lists are imposed for every child, despite their ability to independently complete work. We have no ability to participate in our salary negotiations unless we are active in the union, and then it’s limited. Consider when you send a child out of the classroom for disciplinary action. You have no control over how the administrator deals with that child, which can be very frustrating. No one asks us about the annual calendar, the curriculum choices, or the students we would like to work with. All of these things are assigned to us without our input. Depression can be caused by a perceived loss of control. So it’s no wonder teachers routinely report the symptoms of depression to their doctors, psychologists, and friends. Identifying the problem is the most important part of the equation! Here are some recommendations for you to try, even though they won’t solve all these problems. While we can’t control our curriculum, we can research it. When we understand why someone wants us to do something, it makes it easier for us to try it. Just having a little back story on the strategies from LATI or SRA or your district’s version of trendy try-this! Sometimes, though, the best thing to do is just take a deep breath and go with the flow. This year, I was trying to put together my Deliberate Practice, and honestly, I just wanted to scream! It seemed pointless and trite. Once I decided to do the task for the sake of getting it done, instead of looking at is as anything meaningful, at least to ME, it was over and finished in an hour. Check off that box. Move on! When it comes to making decisions, we can get bombarded with questions, requests, demands, and more from our students. I find that establishing routines in the classroom, from how to sharpen pencils to managing materials to bathroom usage, can be taught and will greatly reduce the number of unnecessary interactions and decisions that you must make as a teacher. If children understand how you want things done, they don’t need to ask. Try using a classroom management system like CHAMPS, a positive behavior system that allows a visual schedule for Conversation, Help, Activity, Movement, Participation, and Success. This will limit the questions and requests related to most behaviors outside of curricular questions. The more thoroughly you teach these routines, the less extraneous noise you will have to process. Finally, we need a serious paradigm shift in how we approach student problems. We did not cause these problems. Worse yet, we cannot fix these problems. We cannot pay the water bill for them. We cannot fix their parents. We can only be solid, strong, and compassionate for our students. The best thing we can do for ourselves is to identify our own hot buttons. What topics or comments set us off most? For me, it was being told that I don’t care. I do. It used to cause me great emotional distress to be told this, and students learned that quickly. By identifying your own troubling statements or issues, you can deliberately make an effort to control your own emotions. However, my biggest release happens on my drive home. I intentionally put everything that happened in the day into a locked “cabinet” in my mind. I roll down my windows and sing VERY loudly and VERY badly! I also practice mindfulness, both in the classroom and at home. By taking back control of my emotions, I have found some relief from school-induced depression. But don’t forget when you add in the principal bullying you and you take that personally as well.